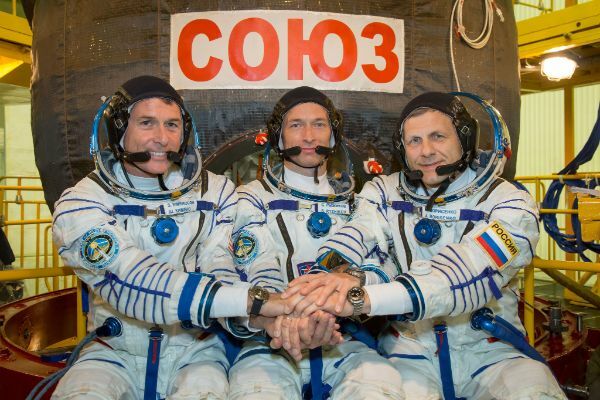 Soyuz MS-02 crew members Sergei Ryzhikov, Andrei Borisenko and Shane Kimbrough returned to the Cosmodrome late last week to resume final launch preparations after their planned September 23 liftoff had to be called off due to an electrical short on their spacecraft. Engineers localized the short inside the Entry Module of the spacecraft and replaced a faulty cable before completing extensive re-tests of the entire spacecraft to ensure no other systems were damaged when the circuit shorted – a time-consuming process that pushed the launch to the very end of the current ISS window. 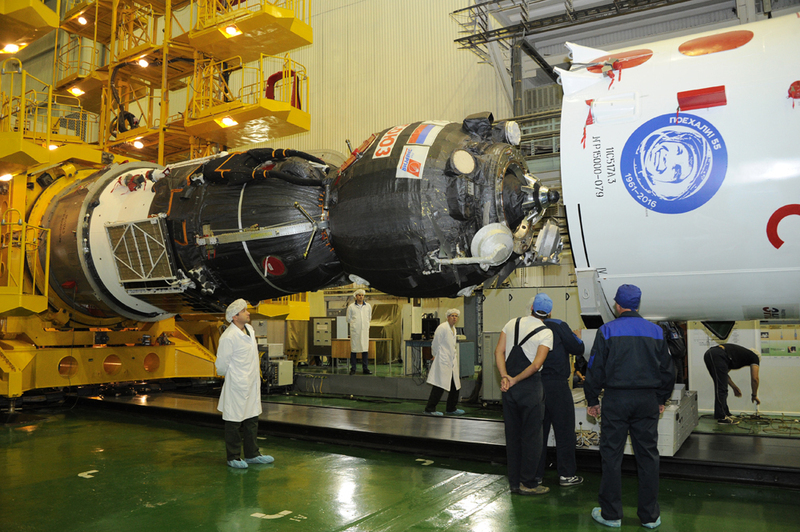 Soyuz MS-02 was re-encapsulated in its protective payload fairing on Tuesday and the crew paid one final pre-launch visit to their spacecraft to inspect the cargo situation aboard the vehicle. 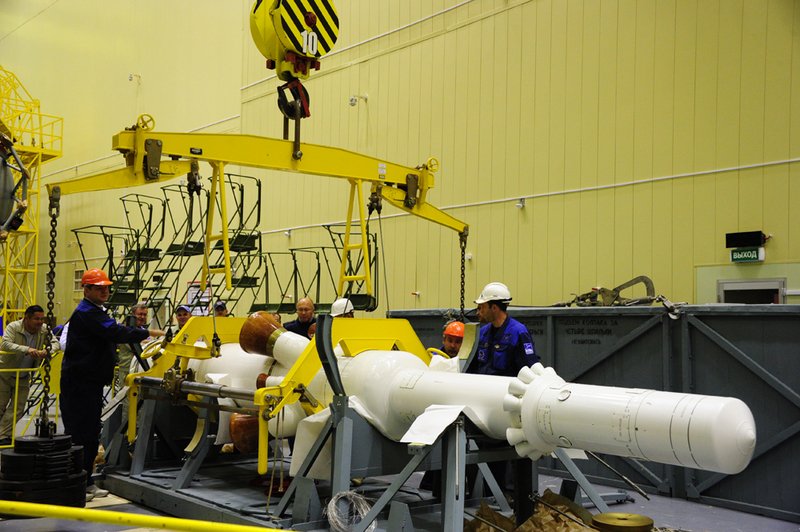 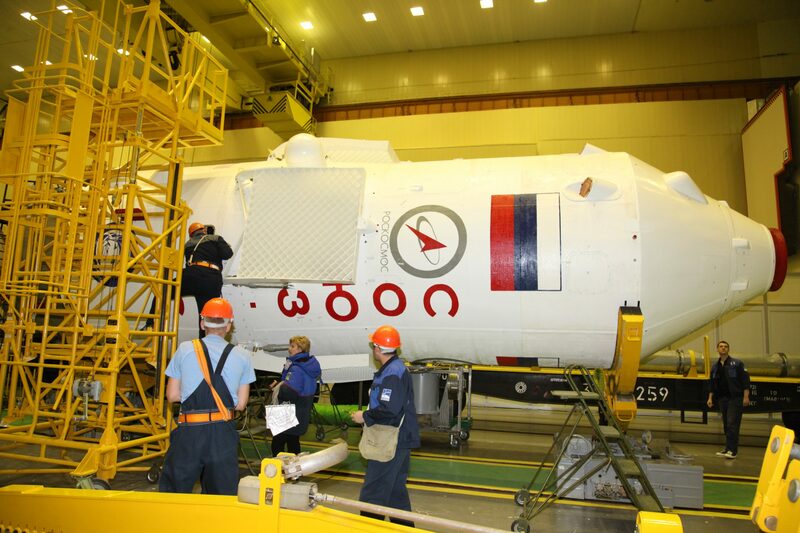 The crew also visited the launcher integration facility to take a look at their partially assembled Soyuz FG rocket that will take them to orbit on Wednesday in a nine-minute ascent mission. 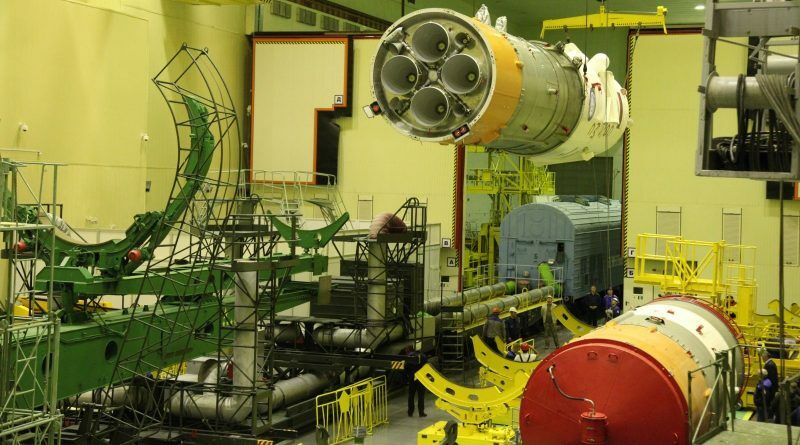 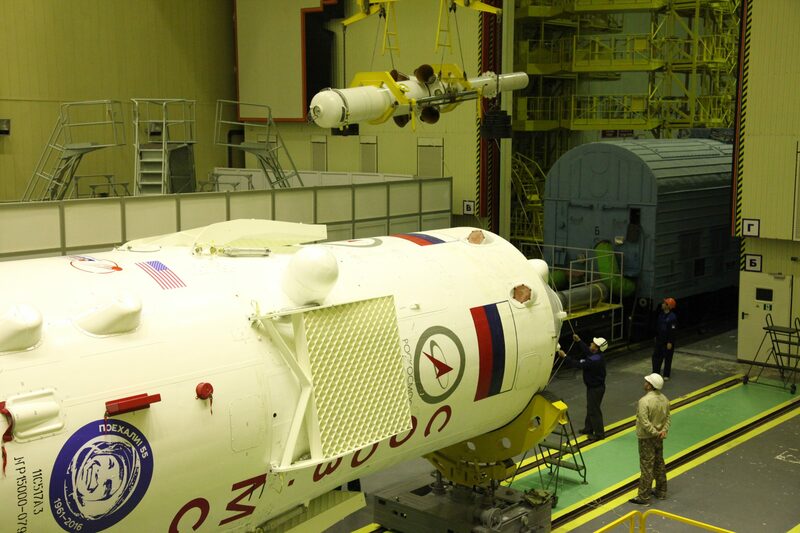 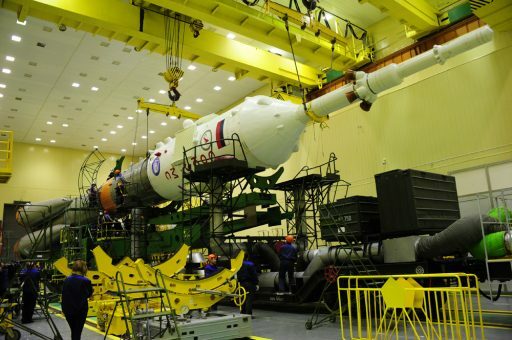 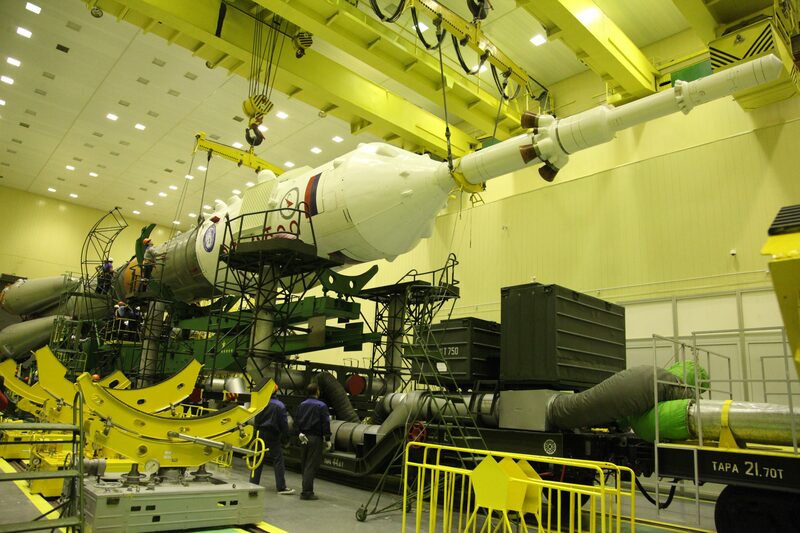 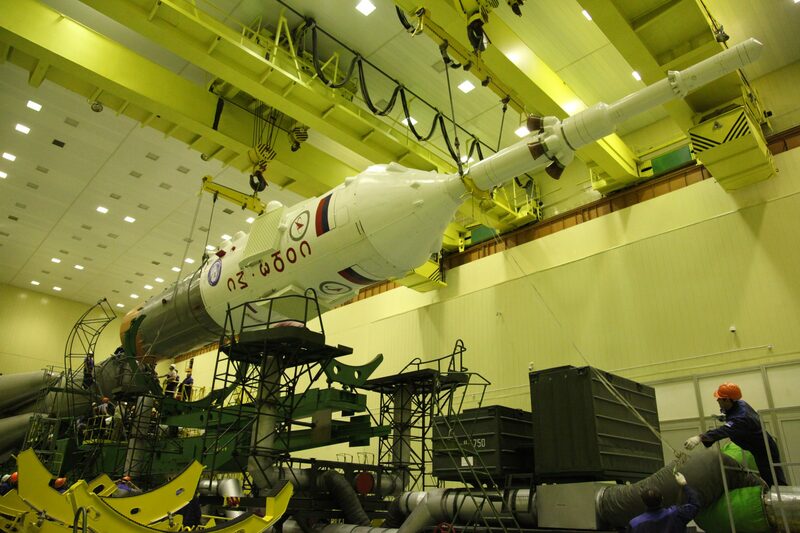 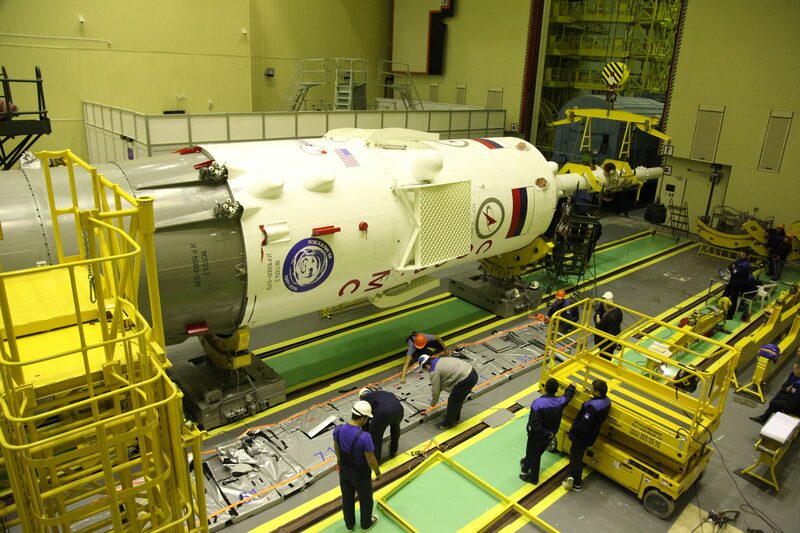 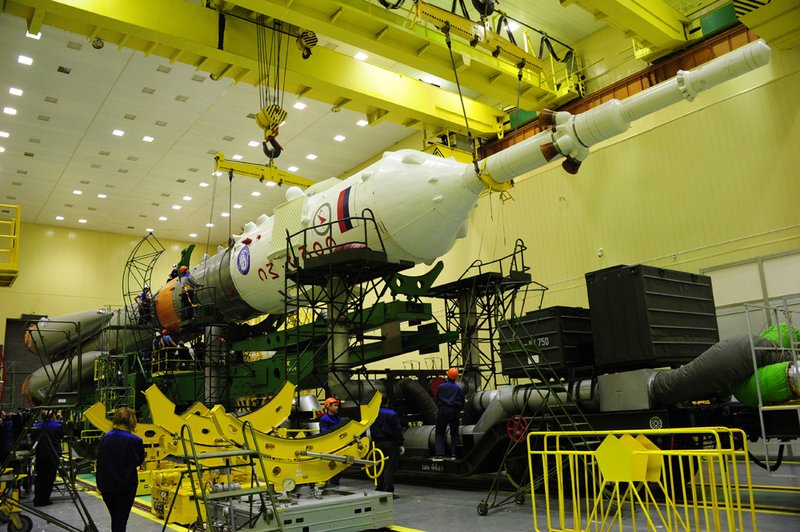 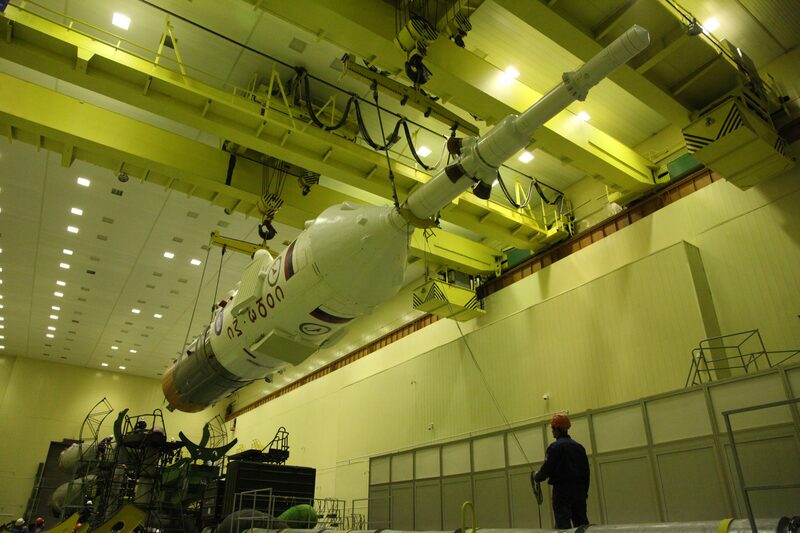 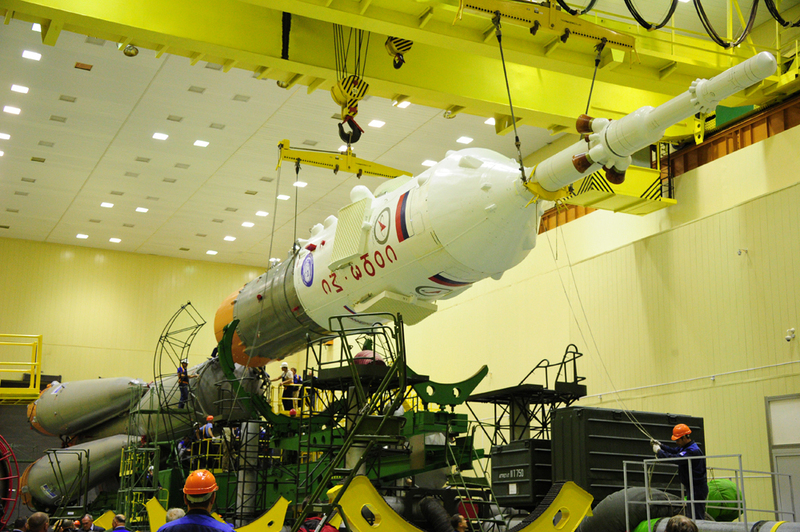 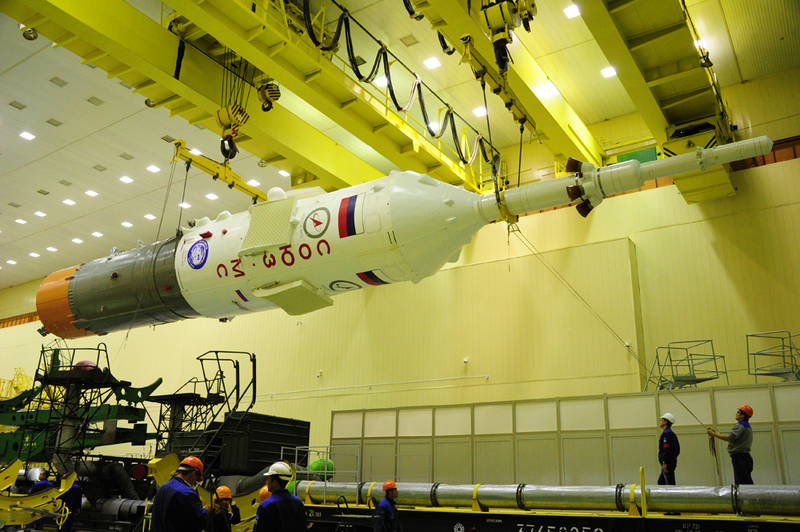 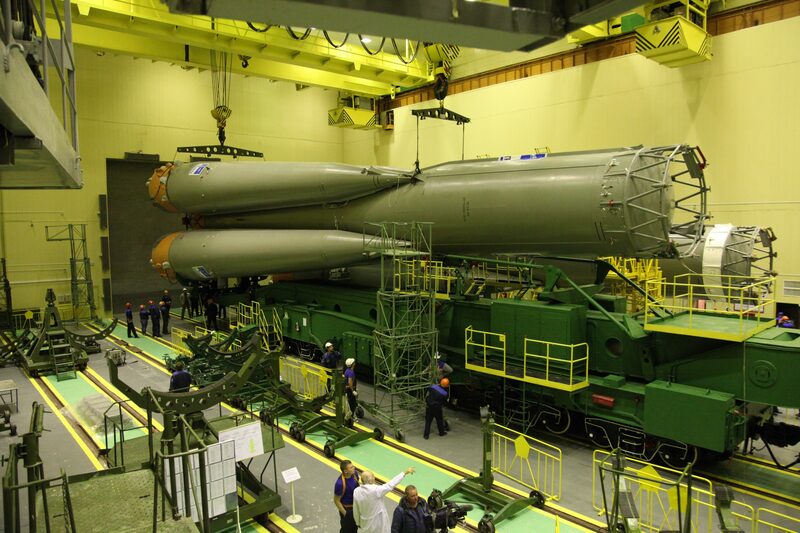 The spacecraft was moved to the Site 31/6 MIK Launcher Integration Facility on Thursday to set the stage for the assembly of the Soyuz FG rocket. 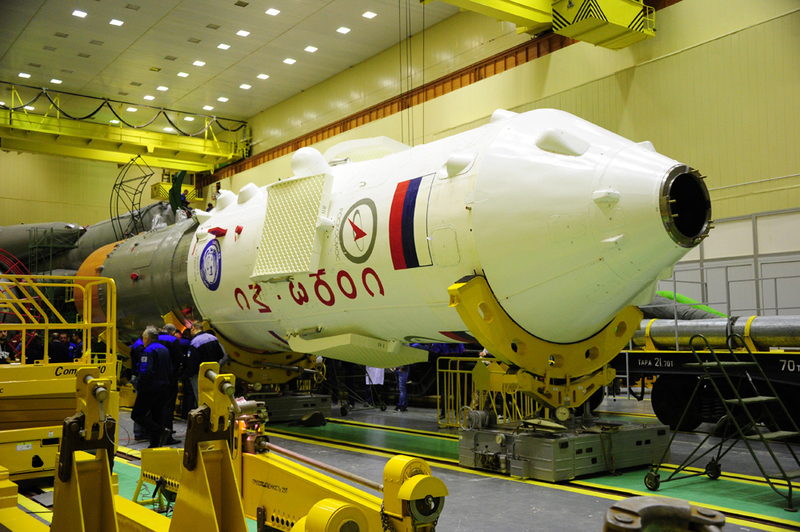 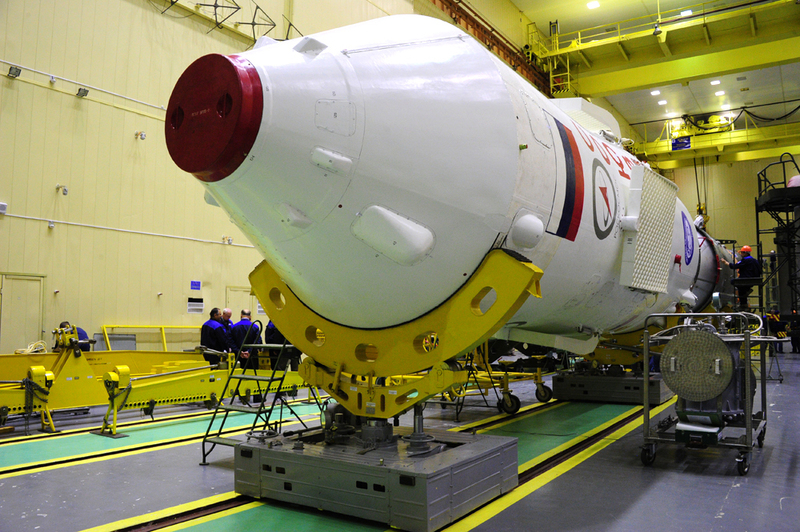 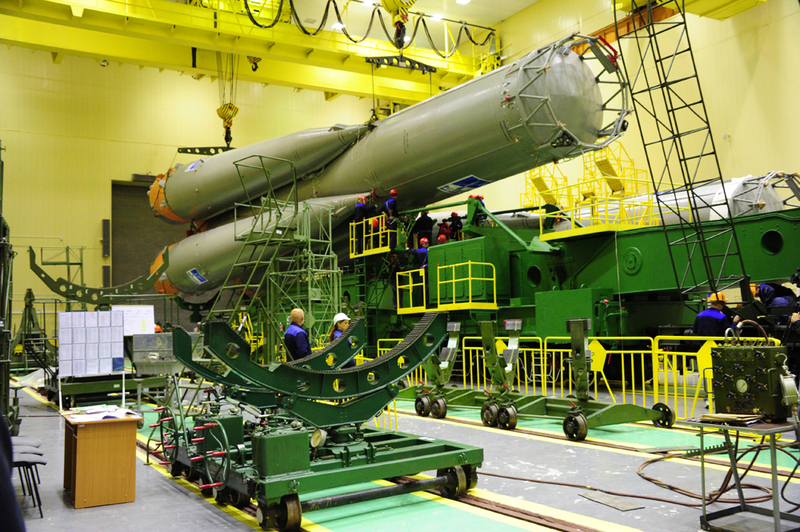 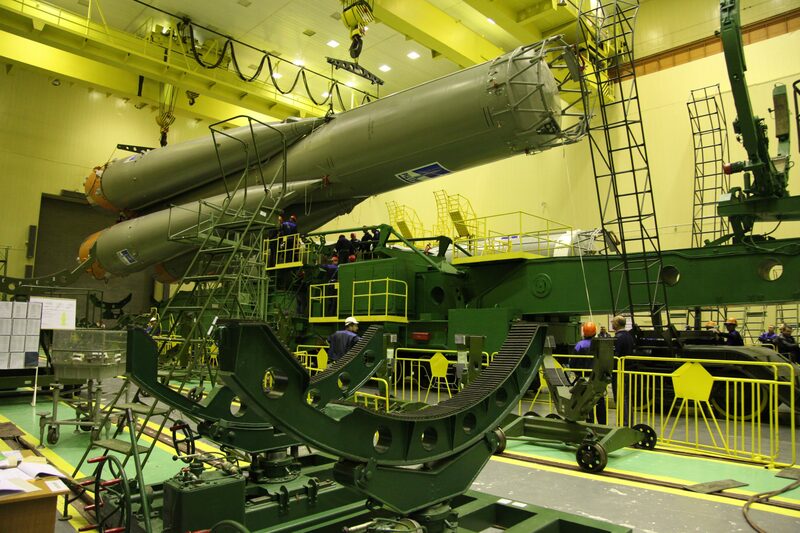 The four 19.6-meter long boosters were installed on the large core stage in the weeks ahead – leaving only the upper composite to be integrated after the Soyuz arrived at the assembly building. 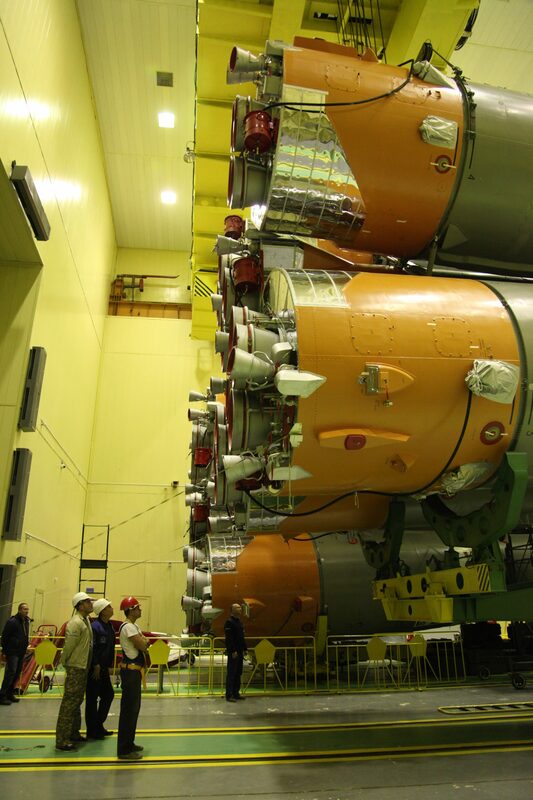 Each hosting a four-chamber engine and verniers for attitude control, the boosters and core stage will supply the Soyuz with a total liftoff thrust of 422 metric-ton-force. 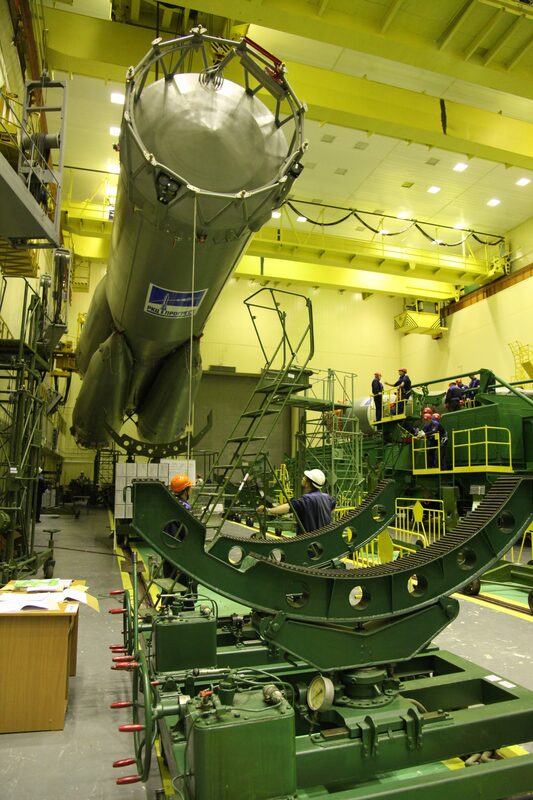 Firing their RD-107A engines for the first two minutes of flight, the boosters will help accelerate the Soyuz to a speed of 1.5 Kilometers per second before dropping away. 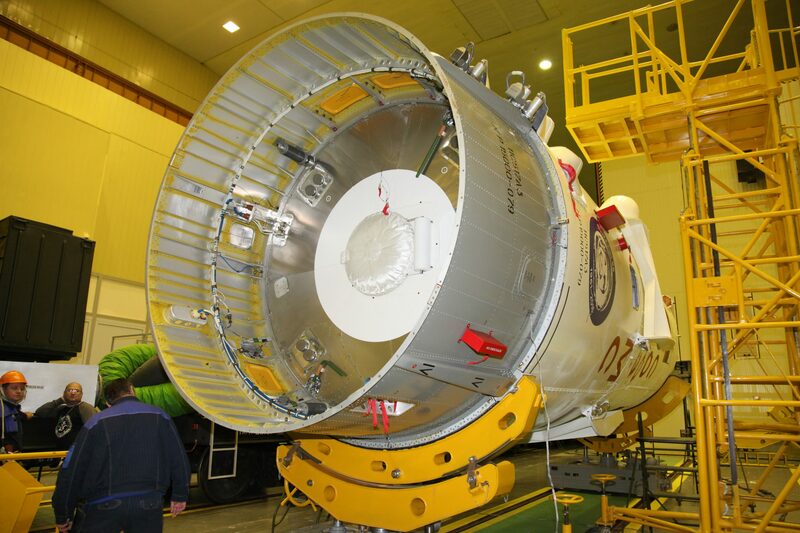 The core stage and its RD-108A engine will burn just shy of five minutes before handing off to the third stage. 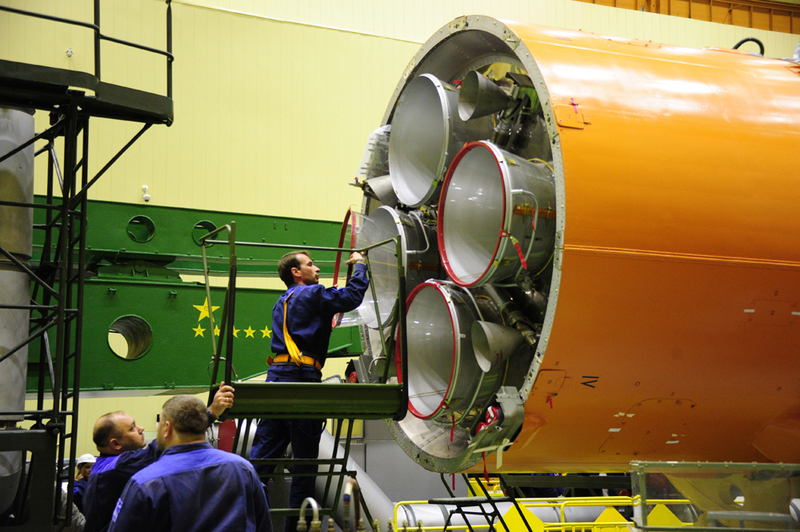 Heading into final assembly, engineers mated the Soyuz spacecraft to the Block I third stage via its payload adapter followed by the installation of the Launch Escape Tower that hosts the solid rockets that would move the Soyuz & its crew to safety in case of a major problem in the early ascent phase. 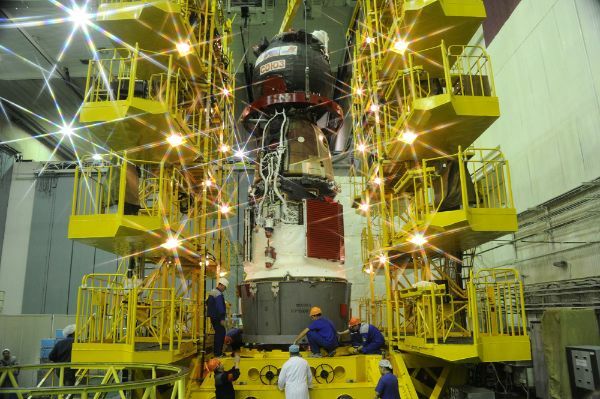 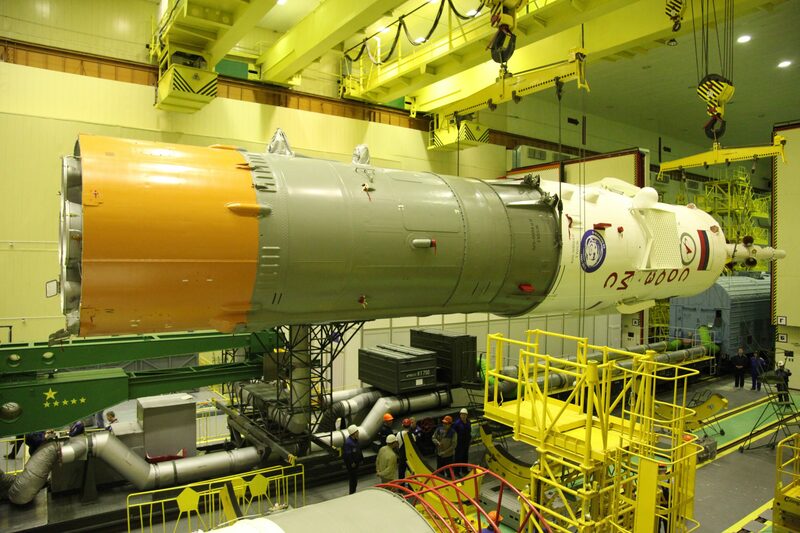 Preparing the upper stage, engineers removed protective covers from the four-chamber RD-0110 engine that will be responsible for a burn of four minutes to finish pushing the 7,200-Kilogram Soyuz spacecraft into orbit. 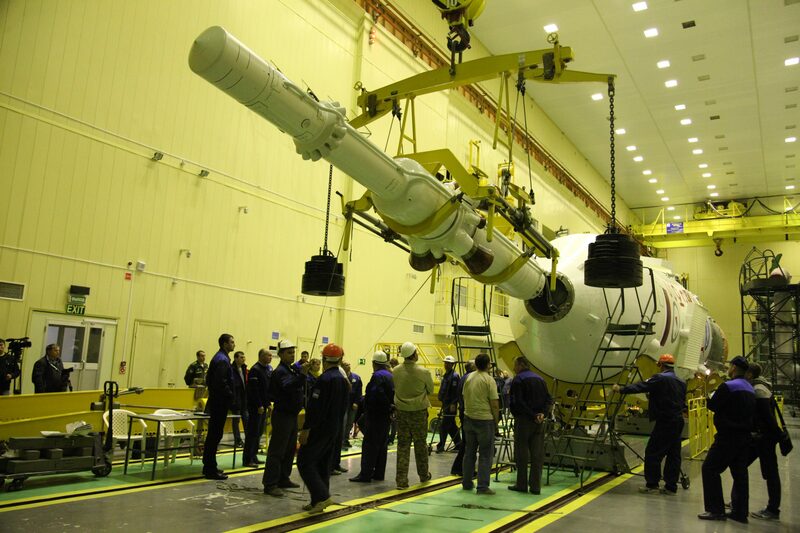 The final assembly step was attaching the Block I to the 27.8-meter core stage and pressing into a final round of testing ahead of rolling the rocket to the launch pad at Site 31/6. 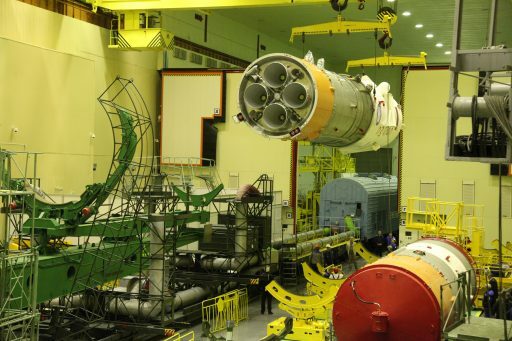 The Soyuz MS-02 and MS-03 missions will be using the 31/6 launch pad instead of ‘Gagarin’s Start’ at Site 1/5 normally used for crewed launches but currently unavailable due to ongoing outfitting tasks of ground support systems. Launching from Site 31/6 requires slight changes to the crew’s countdown timeline and an earlier start to their launch day activities due to the longer bus ride from the suit-up facility at Site 254 to the launch pad. 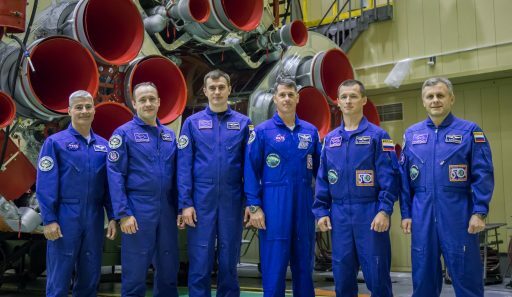 For the crew, the final days ahead of launch are relatively quiet – they are in pre-launch quarantine and can enjoy some free time. 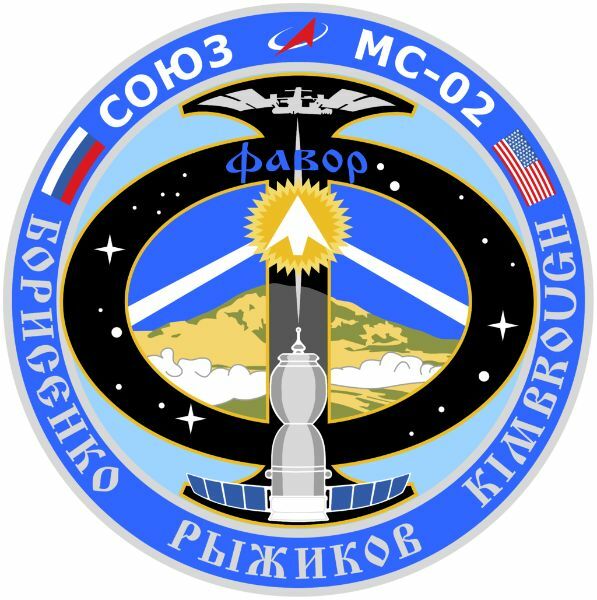 Final conferences of the Soyuz crew with Mission Controllers and the Expedition 49 crew in orbit are being conducted to help in the compressed handover timeline with Soyuz MS-02 arriving only nine days prior to the resident crew’s departure and landing. 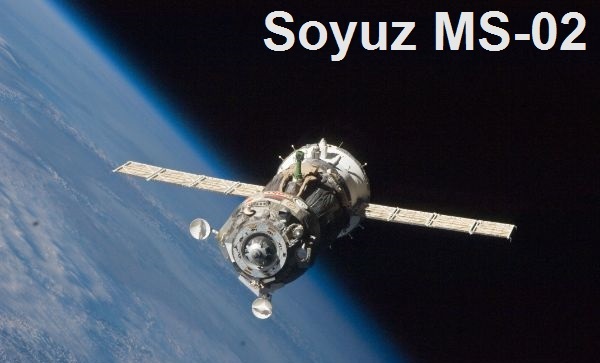 Soyuz MS-02 is sticking to a 34-orbit rendezvous with the Space Station to provide time for continued testing of the systems upgrades introduced on the new Soyuz MS spacecraft flown for the first time earlier this year. 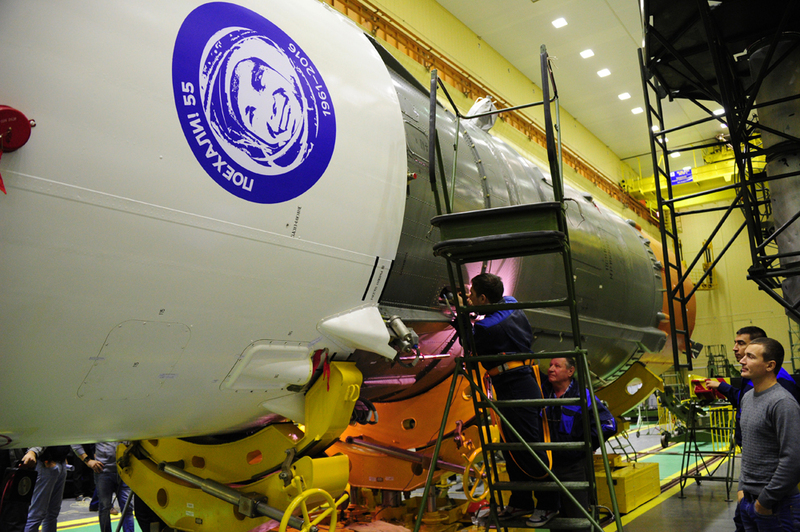 Docking is expected around 9:59 UTC on October 21.